Our culture tends to center around how we can get what we want and become “happy.” What they don’t prepare you for, though, is what to do when you get everything you thought you wanted, yet still feel completely empty. Almost six years ago, I had just moved out to Los Angeles to “live the dream”, and to be honest with you, I really was. I was getting auditions…booking acting jobs…liked my apartment…was making money…went to parties…found myself intertwined with the “in crowd” (whatever that even means). Any possible way the world told me I could find value in myself, I pursued. Not only pursued, but I succeeded. But the strangest thing happened…I still didn’t feel valued even when I lived my life in exact accordance with what others promised would fulfill me. My life still seemed meaningless. loudly I plead with God for mercy. the traps hidden in my path. I must clarify…life with God is not easier. It hasn’t solved all of my problems. It isn’t always warm and fuzzy. I was having a conversation the other night with a good friend of mine, Jessika Fuhrmaneck, who has been on an 8-year journey of restoration from the adult entertainment industry. She was talking to me about the amount of money she was making when she used to dance in the clubs…and how before she laid down her life and began walking with God, she had a nicer car, a nicer home, more money, and ultimately more “value” according to the world’s standards. I shared with Jessika what I shared with you at the beginning of this article…that while I was deeply entrenched in my cave, I had “everything I wanted”…I was living “the dream.” So what was missing? Beauty. Weight. Truth. Hope. Transcendence. Life with God didn’t take away my suffering…but just as I mentioned before, God met me in my suffering. In Hebrew, the word glory is referring to heaviness. Glory is a beauty that has weight…and God’s glory is just that. He brings hope…but not just superficial, temporary hope. It is the heavy beauty that makes hope real. In Psalm 63, David is in the desert, feeling an acute thirst, physically. But he finds that the spiritual thirst is the deep desire that truly needs to be met. David looks back on the moments where he had it all, as I mentioned in my own life. He reigned as king…had great success…yet his soul longed for something more, a purpose that only the glory of God could provide. What comforted David most deeply wasn’t a god who took away all of his suffering. It was that the God he met in that cave was a god of glory and holiness. I had to learn that prayer wasn’t a transaction, but a relationship. That in prayer, we need to see a God of absolute glory (which brings heavy, deep beauty), because that is what outweighs our problems. His absolute beauty diminishes all others. Absolute love conquers all. God met David in a cave. He met me in mine. He can meet you in the depths of your soul, no matter how dark. 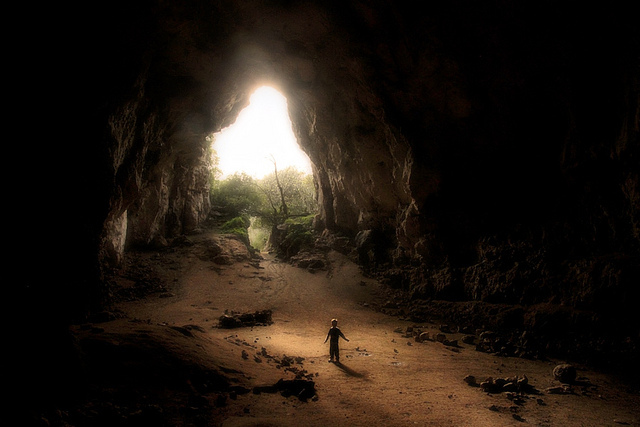 Wherever your cave may be, God not only sees you, but is willing and ready to join you right there, exactly where you are. What’s your cave? Previous postDo More Than Your Day Job. Next postAre We Out of the Woods?